The book, Public Policy Formulation In Nigeria: Challenges and Prospects (Klamidas Communications Limited, Abuja; 2017) is based on the text of a lecture delivered by Dr. Bukar Usman at the Executive Intelligence Management Course with the topic ‘Policy Formulation in Nigeria’ at the Institute for Security Studies, Bwari, Abuja. The lecture approached public policy formulation from constitution-making perspective. The lecture was followed by interactive sessions with both participants and faculty members. In the lecture, the author seeks to answer questions like whether there are identifiable policies of particular interest to some foreign adversaries and impact of any of their interventions. Two, what informed the dissolution of the Nigerian Security Organization? Three, what is the way out of the continuing clamour for restructuring of the Nigerian polity? And four, the extent to which lack of popular participation in public policy formulation has sabotaged policies in the country. Also, Public Policy Formulation in Nigeria has nine chapters, with two significant tables, the first being the creation of states, from four to 36, and the fragmentation of Nigeria. The second table is on the creation of local governments. Yakubu Gowon met four regions. On May 27, 1967, he turned Nigeria to 12 states. The states were further increased to 19 by Murtala Muhammed on February 3, 1976. On September 23, 1987, Ibrahim Babangida added two more states and then created nine more to raise the number of states from 21 to 30 on August 27, 1991. Finally, Sani Abacha added six more states on October 1, 1996 to attain the present 36-state structure. For the second table, where the local governments were tabulated, it started with 301, as created by Murtala Muhammed in 1976 and ends with six Area Councils of the Federal Capital Territory by Abdusalami Abubakar in 1999. Abubakar increased Nigeria’s 768 local governments to 774. Basically, calls for restructuring of Nigeria are indicative of dissatisfaction with the existing constitutional arrangements. The numerous efforts at constitution making in Nigeria since 1914 are proofs of poor leadership, insincerity and intellectual weakness of the Nigerian elite. Indeed, constitution making in Nigeria has become ridiculous. Neither did the creation of states nor the creation of 774 local governments offer solutions in meeting the aspirations of the people. According to Usman, the post-independence era of super permanent secretaries was the golden age of the Nigerian civil service. Until the appointment of civil commissioners by Gowon to assist soldiers in governance, the permanent secretaries functioned as civil servants and as political heads of ministries. As a result of this historical linkage, the author discusses this in his forthcoming book, My Public Service Journey. When Mohammed commissioned leaders of thought to design a new constitution in 1975, the presidential system was adopted. That was because of its fixed term and unifying factors. But it has proven to be very expensive. Under the democratic system, there are three arms of government. They comprise the legislative, the executive and judicial arms. Their roles are clearly defined in the constitution. There are checks and balances in financial and appointment matters. But the government is symbolised in the executive, headed by the president. However, remuneration of public officers is fixed by the National Salaries, Incomes and Wages Commission, as well as the Revenue Mobilization, Allocation and Fiscal Commission. Their recommendations are subject to enactment by the legislature, which has the ultimate power over financial expenditure. At any rate, chapter seven of the book ‘Confidentiality in Policy Formulation,’ according to the author, a retired federal permanent secretary in the Presidency, is responsible for the tardiness and insincerity bedeviling governance in Nigeria. Thus, insincerity and other ills have been responsible for the country’s backwardness. According to Usman, three attempts were mooted to ameliorate the country’s parlous condition. The first was Vision 2010. It was conceived by Abacha; it went down with him. The second was Olusegun Obasanjo’s third term agenda, where he sought to amend the constitution to perpetuate his tenure. And the third was the 2014 Constitutional Conference, organised by former President, Goodluck Ebele Jonathan. Although the conference report was completed, Jonathan was never able to implement it before he was voted out of office in 2015. Usman avers that the highest public policy formulation organ is the constitution and highlights how contentious it could be to formulate one successfully as instances have shown in the country, especially with the Petroleum Industry Bill and Olusegun Obasango’s attempt at constitutional reform in 2005. However, he argues that making a ‘perfect’ constitution is not enough as its operations depend on ‘men of goodwill’ to make its provisions affect the lives of citizens. For Usman, a seasoned administrator, therefore, the current agitations to restructuring the country are not necessarily borne out of a faulty constitution as much as the lack of vision among official operators of that legal instrument. 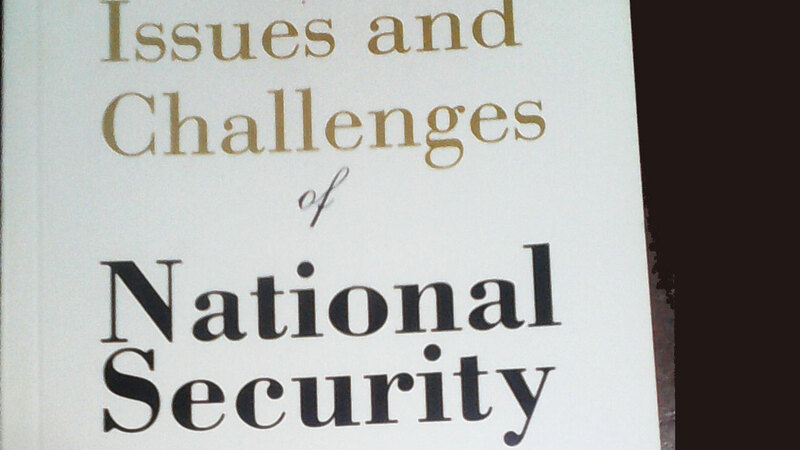 Usman’s second volume, Issues and Challenges of National Security (from the same author and publisher as above) dwells on nation building. Like the previous book, it is also out of an extended paper Usman presented at a workshop for members-elect of the National Assembly held at Yola, Adamawa State in May 2011. The induction focused on socio-economic issues affecting security and the welfare of Nigerians. The topics and views expressed covered the 1999 Constitution, democracy, national development, and the legislature’s role in national security. For Usman, the broad definition of security encompasses the following: Measures taken by a military unit, activities or installations to protect it against acts designed to or which may impair its effectiveness. Accordingly, security as a strictly non-financial term encompasses freedom from risk, danger or fear, safety, freedom from anxiety, doubt to something that gives full confidence, safety and measures adopted to prevent theft, sabotage and the wrath of the law. From the foregoing, it is clear that national security is concerned with the continuing safety of a country, its infrastructure and peoples and institutions. Thus, many measures ensuring individual and national safety are usually taken. Such measures include using diplomacy to rally allies and isolate threats. Security operatives also marshall economic power to facilitate cooperation. Measures are also put in place to maintain effective armed forces, civil defence and anti-terrorism legislation. Counter intelligence services such as secret police are used to protect the nation from internal and external threats. Of importance is Usman’s treatment of ‘security budget’ and ‘security vote.’ In Nigeria, these provisions have become as contentious as they could be. While so much is budgeted for security, it appears not much result comes out of it, as a majority of security officials look worse for wear in terms of poor kits and remunerations. In the mean time, hapless citizens live in fear of security threats. Between security budgets and security votes, there appears to be some opacity that defies explanation or logic. Sometimes, it appears expediency becomes overriding on how such monies are spent. Usman names Jerome Udoji, who served both the colonial and independence governments, as throwing more light on ‘security vote’ and why it was so created and the method of operating it. Indeed, with these two slim volumes, Usman has shown adroitness as a leading public administrator, who went through the rubric of civil service procedures and how to apply them judiciously. Although retired, Usman has been mentoring younger officers and other professionals on how things work. These two books are timely interventions in the processes of public policy formulation and national security management in Nigeria.